Each flower is unique... just like every wedding couple. Therefore, it's my privilege as a wedding floral designer to harmonize and enhance the immense possibilities beyond just the traditional or expected floral and décor options in each event. I want your guests, when they first enter the ceremony or reception venues, to be flat-out blown away! Instead of just seeing the flowers and saying, "That's pretty", I want your guests to really LOOK and wonder "What's THAT flower!?" or exclaim, "Brilliant! Never thought of doing something THAT way!" It's delightful when I get opportunities to blend so-called "traditional" blooms (roses, lilies) with more off-the-wall options that make the floral design and décor elements for each event specially distinct and noteworthy. It's a little extra something that makes your wedding day stand apart from the crowd. 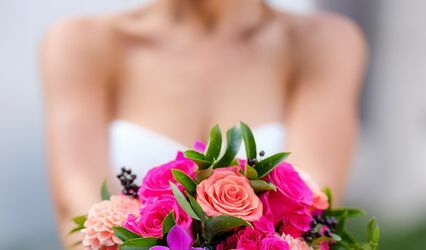 Wedding flowers should be brilliantly out of the ordinary & unique to each couple! I thrive on designing such that are imaginative & wondrously jaw-dropping! 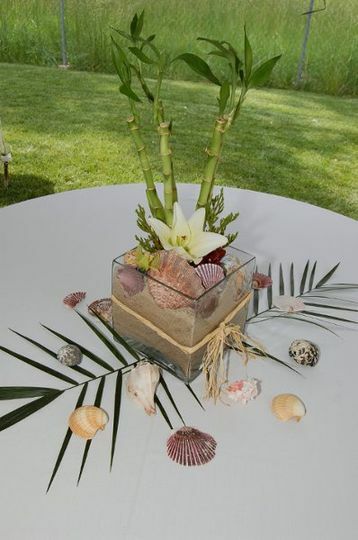 Innovative botanical décor and floral design specializing in wedding celebrations and events. 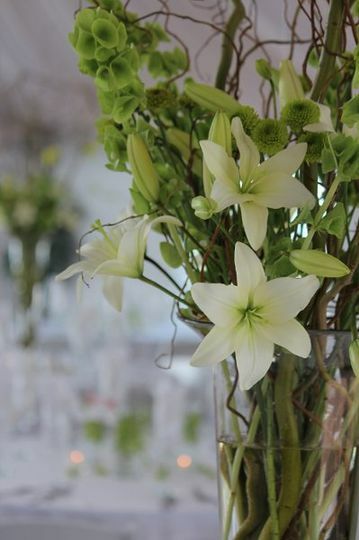 Being an owner of a botanical and floral design company allows a greater degree of flexibility to explore captivating floral, greenery and color combinations that are inspiring for my customers and interesting for me to arrange. Graduate from the Floral Design Institute in Seattle (2003) in Floral Design and Advanced Floral Design. While there I studied contemporary and traditional floral design techniques, as well as ikebana, tropicals, novelty and large scale botanical construction. 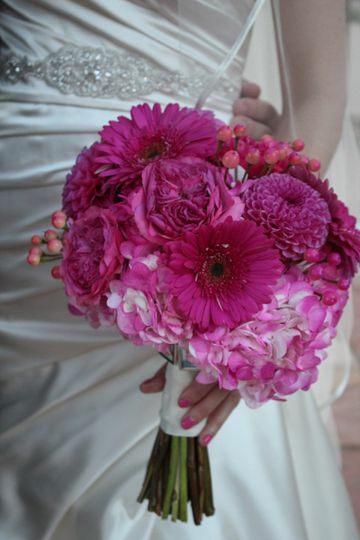 I was instantly drawn toward focusing on forward-thinking wedding floral design, décor and event organization. Bridgette was wonderful and very open to ideas from everyone involved. She stuck around to make sure that all corsage and boutonnieres were pinned on the grandparents properly when they arrived, even when we had planned on her leaving hours before. She coordinated with the banquet manager to ensure that returning of the rented equipment did not fall on the bride/groom or their families. In the planning process, she asked questions that no other vendor even approached in face-to-face meetings (to include allergies of all parties getting flowers). She made recommendations for aspects that didn't directly relate to flowers, but made an impact in the overall vision of my wedding. All of my flowers were GORGEOUS! Bridgette took my bouquet idea and made it an incredible reality! 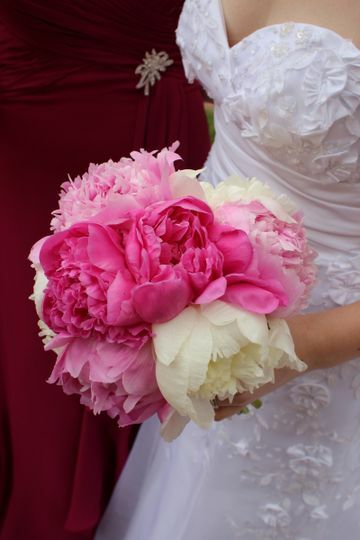 I would highly recommend using Bridgette for wedding flowers! You will NOT be disappointed! Awww... you're so sweet, Katie! Thank you so much for the glowing review! I had a ton of fun working with you. You were such an easy and organized bride, and let me tell you, that's so wonderful to have on occasion! Having a bride that makes my "job" not feel like a job, but kind of like a fun little treasure hunt/mission, with the outcome being extraordinary. I'm very pleased that you and Tyler were thrilled with it. Looking forward to seeing pictures! Many many years of wedded joy to you both!!! Holy frijoles, Gingerlynn! I had such a blast working on your wedding. Loved trying out new things with textures, and containers (hello pumpkins! ), and fun color combinations. And—bonus!—got to incorporate one of my favorite flowers into the mix too (blue eryngium). You and Zach were a hoot to work with... would totally do it again! Thank you for asking me to help with your special day. And thank you so much for the pictures from Sarah Rose Burns Photography. I will eventually get my website up and running (...eventually...) and plan to include some of hers. Wishing you and Zach fun and laughter and love for many years to come. Even though I was a not an expert on flowers going into this process, Bridget guided me through and made my flowers even better than I imagined possible. If you want value, expertise, and commitment, I would highly recommend Bridget. 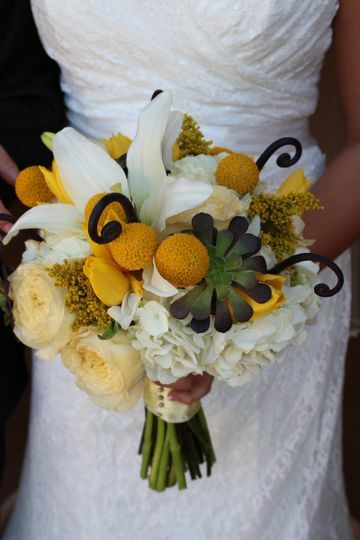 Her personal touch was on every bouquet, every centerpiece, every boutonniere as if this was her wedding day. 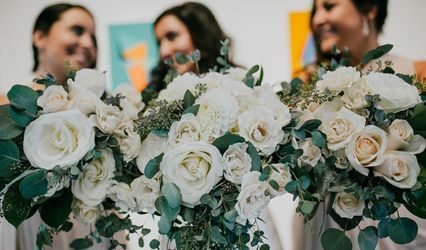 After interviewing her and the other florists I ultimately went with Bridgette because out of everyone that I met she is the only person who actually got me excited about the flowers for my wedding. 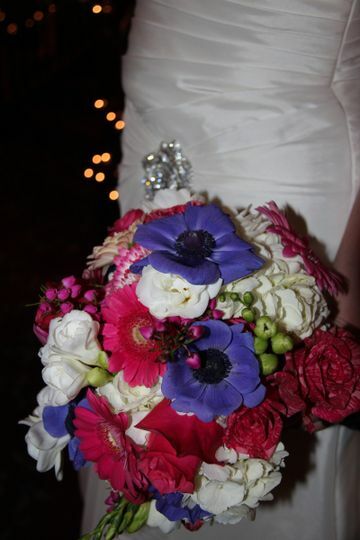 She designed me the most amazing bouquets over and over again adjusting the flowers within to fit my budget. She even advised me on the flowers to use and the flowers that were not in season. 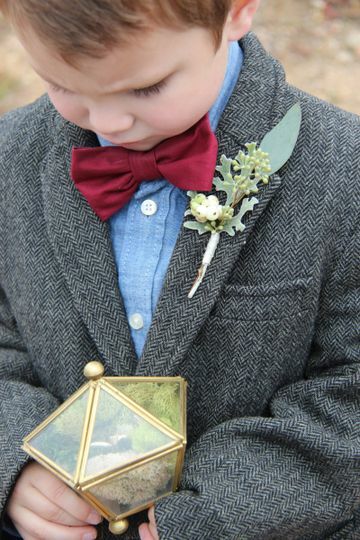 She did extra research to find a plant that would look cool in the bouquets and then special ordered it. She took the time to make sure that I knew what I was going to get and that it was what I wanted. The planning process could not have been more fun and collaborative. The actual wedding flowers did not disappoint. Bridgette was on time, if not early, to set up our reception hall. 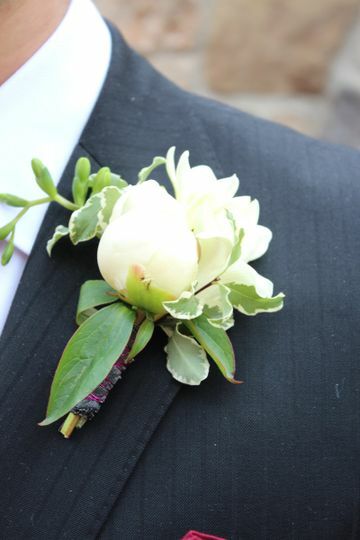 She went into the guys rooms and pinned the boutonnieres on their jackets for them, then she came into the my room to bring us our flowers and made small last minute changes, to the length of the stems, in the room. The set up went smoothly and she came after the wedding to take everything down. The arrangements were breath taking. It was some of the most creative flower work I have ever seen done. Everything flowed together and it was exactly what I wanted. 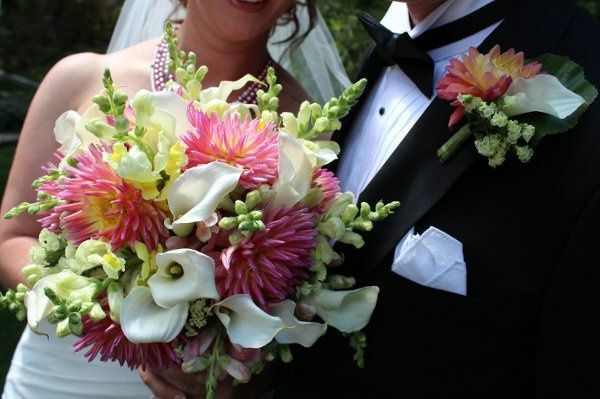 Even a few weeks after the wedding I am still getting compliments from men and women about how great the flowers were. I loved working with Bridgette and am sad this process is over because now I won’t get to talk to her anymore, except when I email her random questions for other people. Lauren... wow, just wow! Thank you for such a heartfelt review! 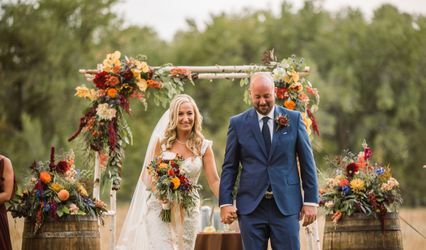 And thank you so much for being open to some crazy flowers, foliages, designs, and well... just putting your trust in the fact that I wanted to make your wedding truly exceptional given a somewhat tricky color palette. Your wedding was one of the most fun and beautiful weddings I've had the chance to be a part of. Thank you for that! While I got a few pictures, my camera was on the wrong setting for the majority of them, so I would LOVE to see some of yours! And anytime you want to chat, feel free to call! Would love to hear from you! All the best to you and Zach!